The Albertville Board of Education recently recognized students that participated and won awards in the 2018 Technology Conference. Pictured are Albertville High School Principal Dr. Deidra Robinson (left) and Superintendent Dr. Boyd English (right) with members of the Albertville High School team. The Albertville Board of Education recently the Albertville High School ProStart Culinary team for winning the state competition. The team is currently in Providence, Rhode Island, competing in the National ProStart Student Invitational. 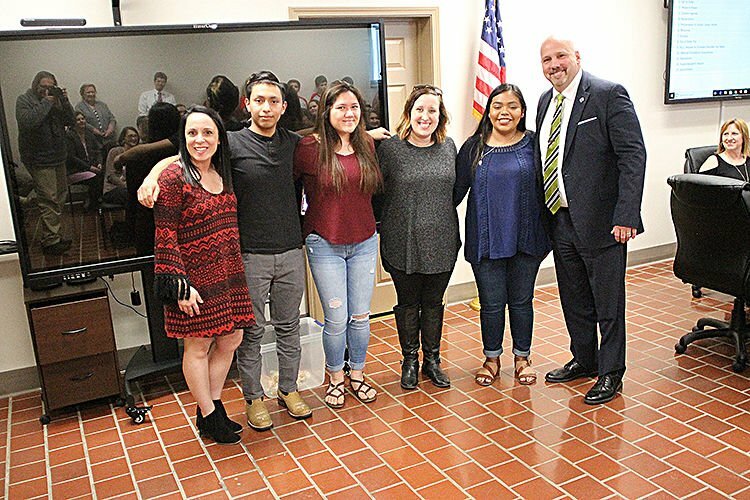 Pictured are AHS Principal Dr. Deidra Robinson, Eduardo Rodriguez, Destiny Thomas, culinary instructor Lauren Bolding, Anahi Ortiz and Superintendent Dr. Boyd English. Not pictured are team members Noah Kirkland, Moni Bell and Casey Pizano. The Albertville Board of Education recognized a room full of students for their achievements during the academic year. Superintendent Dr. Boyd English first recognized Will Aycock for being elected North District Future Farmers of America president for the 2018-19 school year. Culinary instructor Lauren Bolding was called on to recognize the Albertville High School ProStart Culinary Team. The team won the state ProStart Culinary Championship and will travel to the National ProStart Student Invitational in Providence, Rhode Island, April 26- May 1. The team consists of Anahi Ortiz, Destiny Tomas, Eduardo Rodriguez, Moni Bell, Noah Kirkland and Casey Pizano. Bolding said the culturally diverse team combined Mexican and Southern cuisine to create a three-course AlaMex meal at the state level and have been working to improve the dishes for nationals. 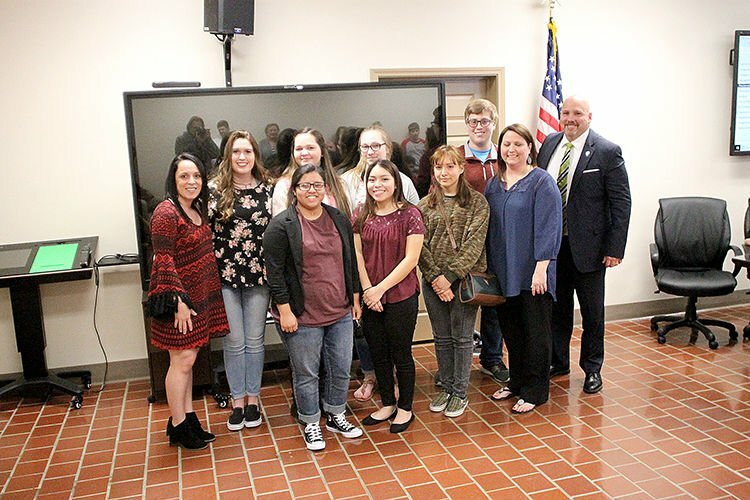 Lauren Thompson and Kassidie Bailey recognized Evans Elementary students, Spring Charles recognized Albertville Middle School students and Wendy Aycock Recognized Albertville High School students that placed in the 2018 Technology Conference in Rainsville. First and second place students will compete in the state competition in Montgomery April 28. IT Test, first place Melvin Benetiz; group animation — first place, Ava Owens, Karlin Shirey and Kailyn Boman; Individual — competition program, third place, Ethan Owens; group competition program — first place, Wesley Knight, John McCullars and Connor Price; group internet applications — second place, Kerigan Bryan and Pearl Bilbrey; individual multimedia — third place, Levi Hester; group multimedia — Trenton Cordell and Jakob Myrick; individual productivity design — (tie) first place, Brannon McElrath and John Rogers; second place, Erick Canseco; individual video production — second place, Andrew Reyes; third place, Anjoli Trinidad; individual robotics — second place, Gavin Jones. Animation — first place, Alex Branch; second place, Levi Windsor; computer programming, third place, Tommy Henderson; internet applications group — second place, Ashton Bryant and Mackenzie Paschal; internet applications individual, second place, Ana Martin; productivity design — second place, Jennifer Juan; third place Jade Potter and Kiyah Reno; robotics, first place, Canaan Jones, Tristan Golden, Elaina Collins, Jensyn Seay, Emily Vaughn and Hunter Baldwin;second place, Charles Witherow, Reymond Santiago, David Garcia, Jordan Underwood and Bailey Hallmark. Productivity design — first place, Baylee Morgan; internet applications group — (tie) first place, Gracie Faulkner, Abbie Stanfield and Britley Castellon and Makayla Shelton and Anna Parr; internet applications individual — second place, Karson Nesbit; robotics — first place, Angie Ochoa; IT exam — first place, Anna Parr; video production individual — second place, Baylee Morgan; video production group — second place, Juana Mendez and Abigail Hernandez; third place, Alis Edwards and Justin Macmahon.